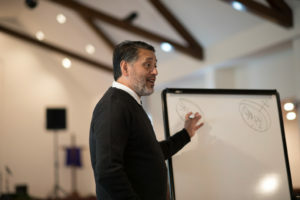 From February 7-9 CCDA President Noel Castellanos shared the biblically-based CCDA approach to ministry at Praxis Forums with NYC ministry leaders events in Harlem, Brooklyn, and Nyack College! A special thanks to Maurice Winley and Soul Saving Station & Living Redemption Youth Opportunity HUB in Harlem and Pastor Charles Galbreath & Clarendon Road Church in East Flatbush for hosting these Praxis Forums events! Noel shared about the centrality of the incarnation of Christ who was born in a marginalized community whose mother Mary had to endure all the innuendo of becoming pregnant before getting married, how his parents fled persecution and became refugees and when after living as a Galilean for thirty years embarked on his public ministry citing Isiah 61 but adding “that the blind will see”, not recruiting by the resumes of Jerusalem but choosing Galileans to do ministry with, and spending time with those on the margins of society before being arrested and sentenced to death outside of the city in a place of death. Who was the blind that Jesus spoke of? Religious leaders and those who felt they need no healing. Noel shared that the new wine of ministry is one of downward mobility and doing ministry with the community versus treating people as targets of ministry. His message led to great conversations in Harlem & Brooklyn! Nyack students were challenged to consider live this incarnation of God’s love, justice, and mercy! If you missed it I have some good news on ways you can tap into what Noel shared. Much better than I can convey. CCDA carries on a rich biblically based approach to doing ministry that can be found in the Gospel and the ministry and teachings of St John Chrysostom, St. Francis, Dietrich Bonhoeffer, Dorthy Day, Dr Martin Luther King, Gustav Gutierrez, Archbishop Romero, The Salvation Army, John Wesley, Wilberforce, Desmond Tutu, the African American Church, Azuza Street revival & William Seymour, and the abolitionist movement to name just a few places where CCDA practices can be found even before it’s founding. In New York examples of CCDA type ministries abound both past & present at New Life Fellowship, Allen AME, Bethany Baptist, Concord Baptist, Abyssinian, the late Dr. Wyatt, Bo Nixon of New Life, Dr. Rivera & the Latino Pastoral Action Center, Christian Cultural Center, The Salvation Army, Bowery Mission, First Corinthians, Soul Saving Station, Exodus Transitional Community, FPWA,67th Precinct Clergy Council & God’s Squad, Nyack College & Alliance Theological Seminary, Bronx Bethany, Community Connections for Youth, Not on My Watch, and the work of countless leaders like Dr. Michael Carrion, Robert Guerrero, Mitchell Torres, and many others (too many to list) are examples of CCDA here in NYC! CCDA provides a language & framework for ministry that I’d invite you to explore as you engage in ministry in your community! Please take a look at CCDA’s study tool Immerse. You can sign on here!